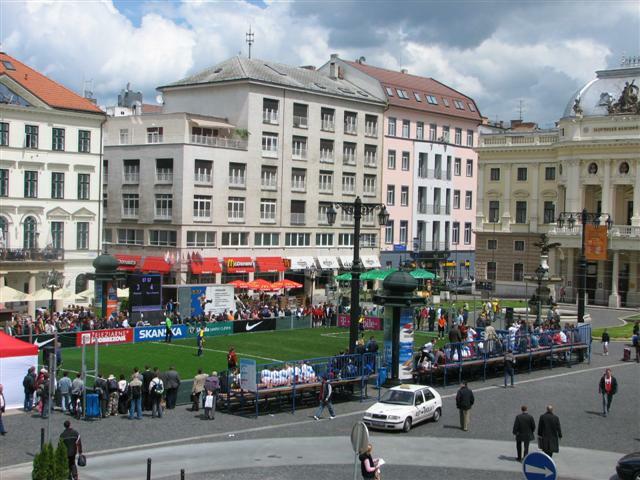 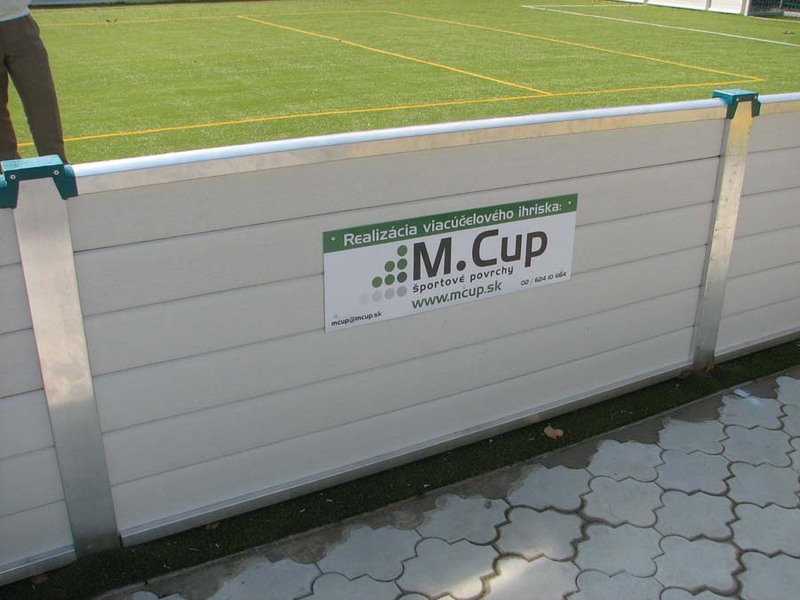 In recent years M.Cup as devoted its attention to construction of multi- purpose pitches. 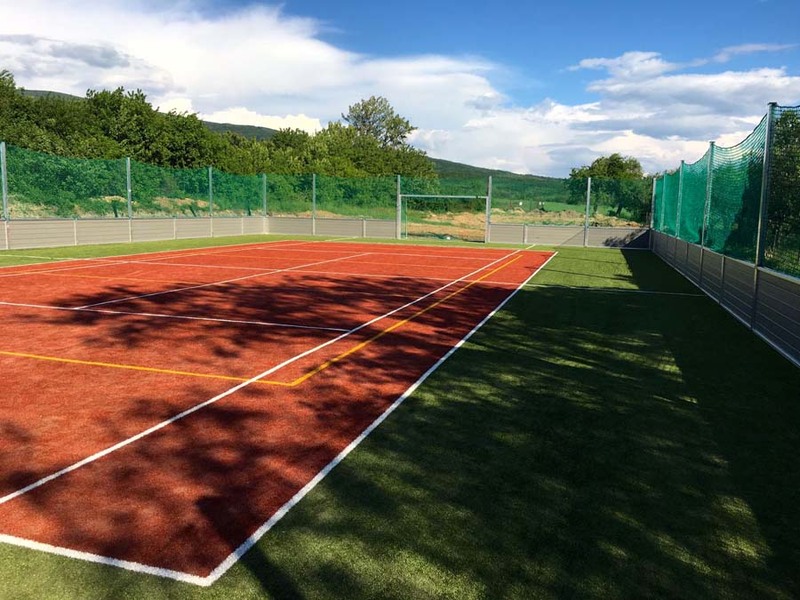 This project has been created with cooperation of Slovak Football Association and government authorities to revival and enforces sport spirit of all age groups. 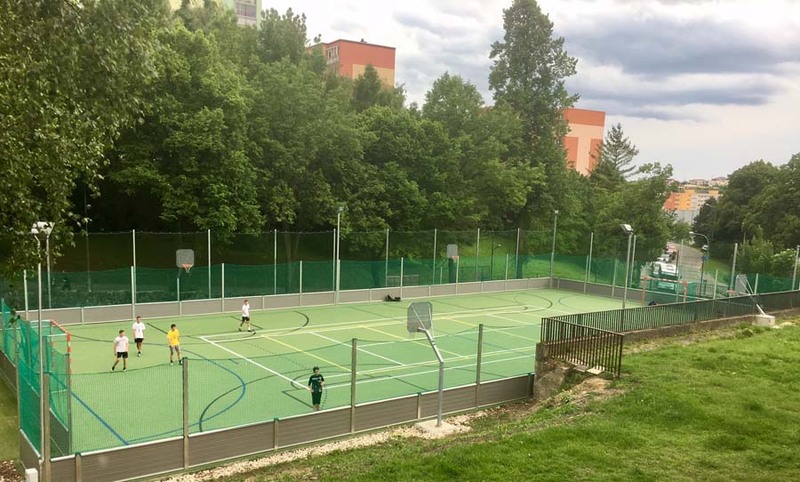 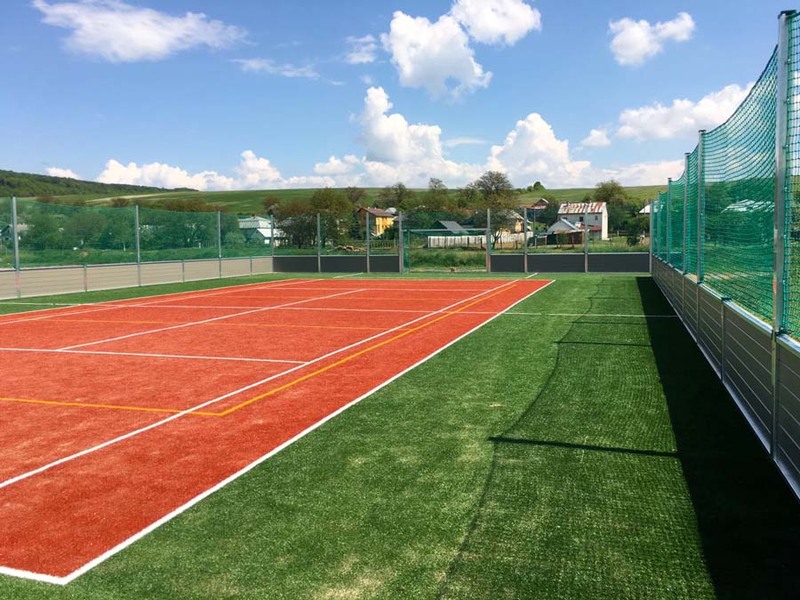 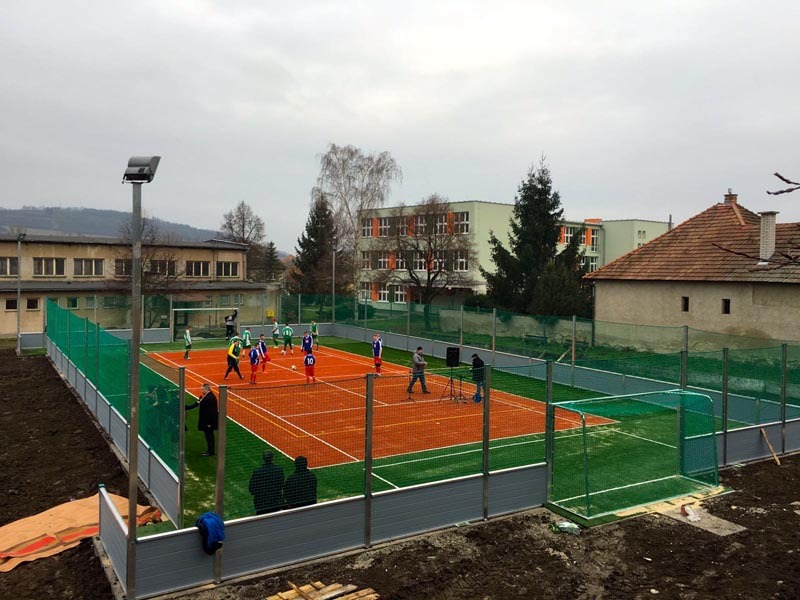 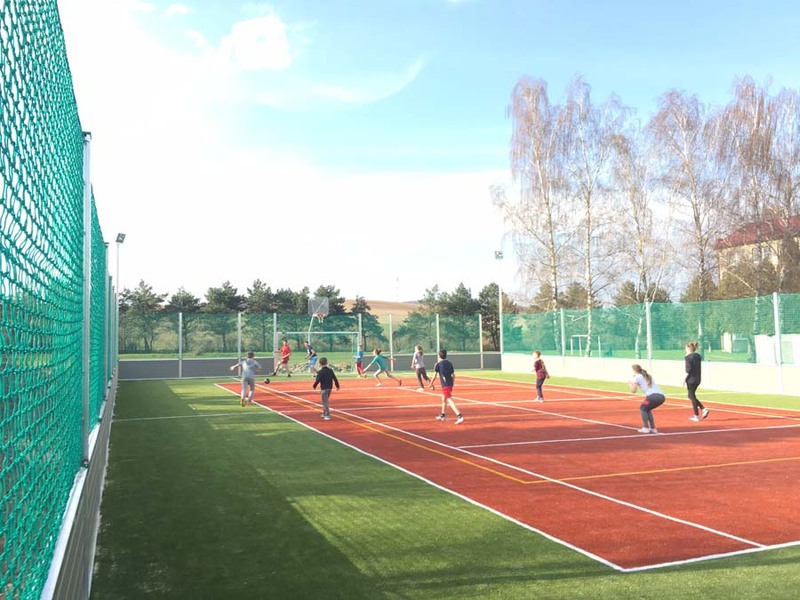 After success of this project Government of Slovak Republic continues to build multi- purpose pitches in schools and public places across the country. 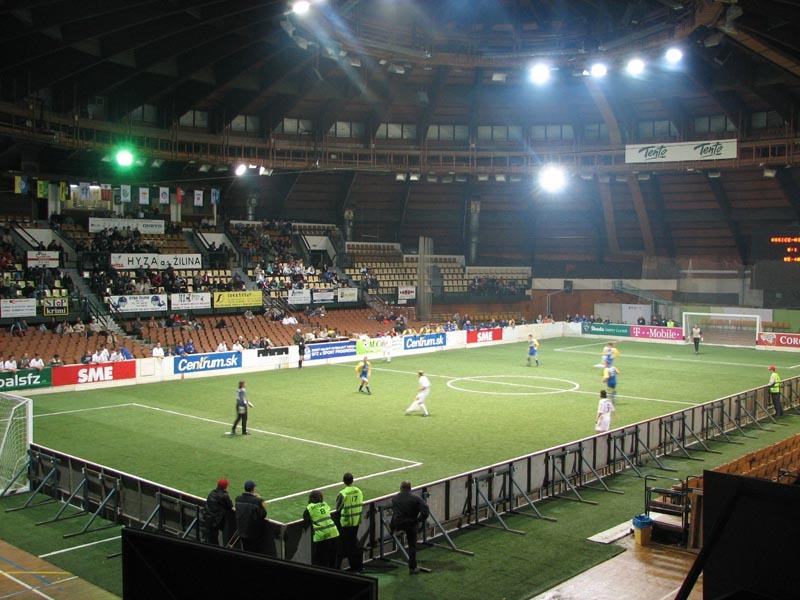 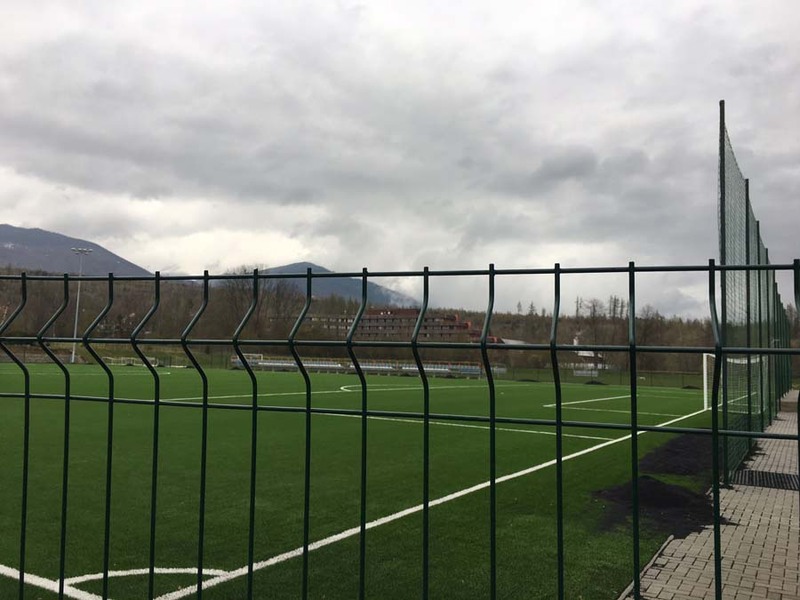 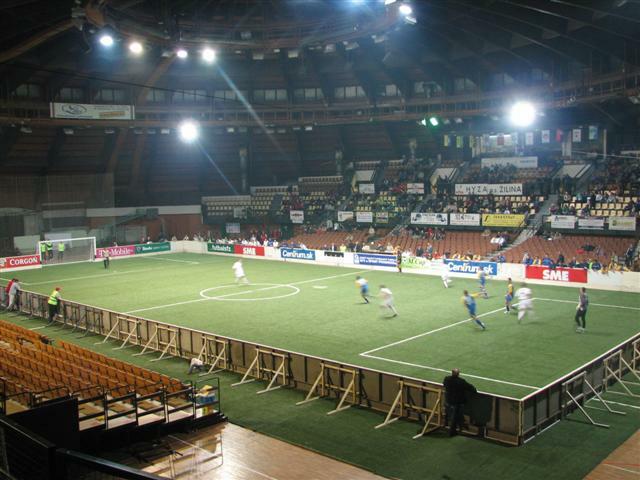 Our company has been chosen at the beginning of project by Slovak Football Association as supplier and constructor of Multi-purpose pitches considering multiple positive experiences with former institutions, our company is still integrated in continuation of this project under the auspices of Government of Slovak Republic. 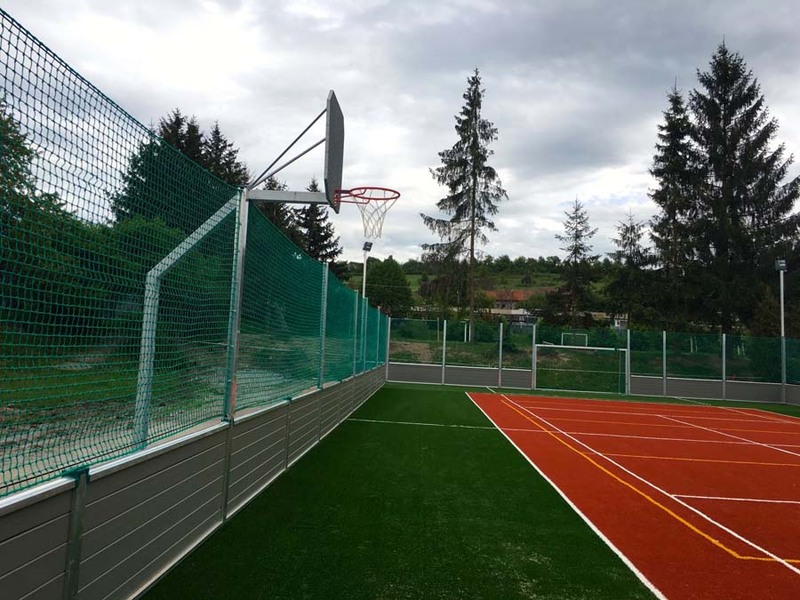 We would like to introduce to you compact multifunctional pitch with area from 250 to 800 square meters, playground made of artificial grass. 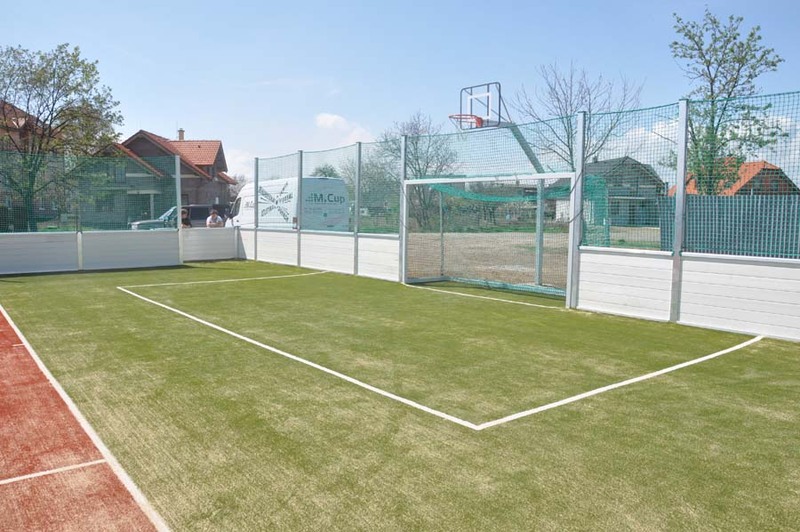 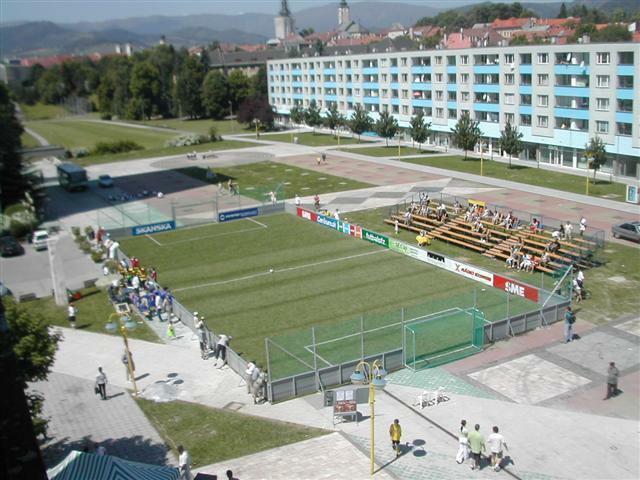 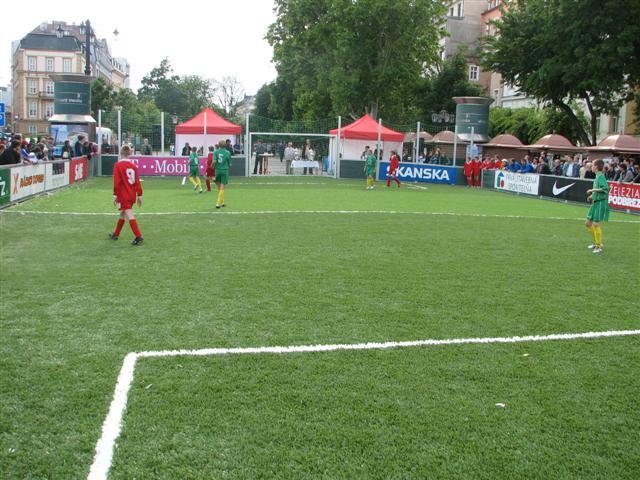 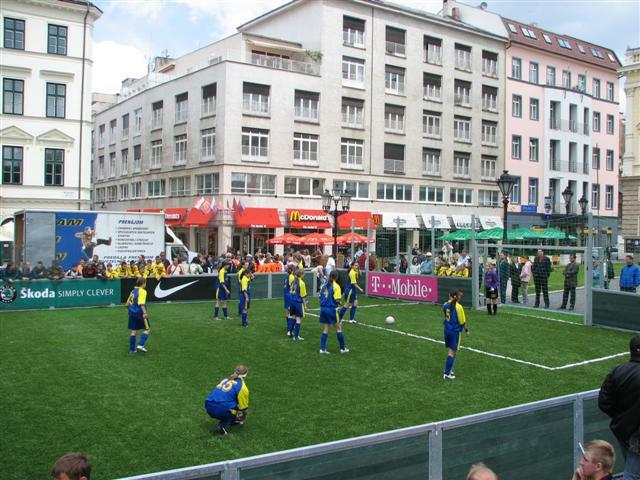 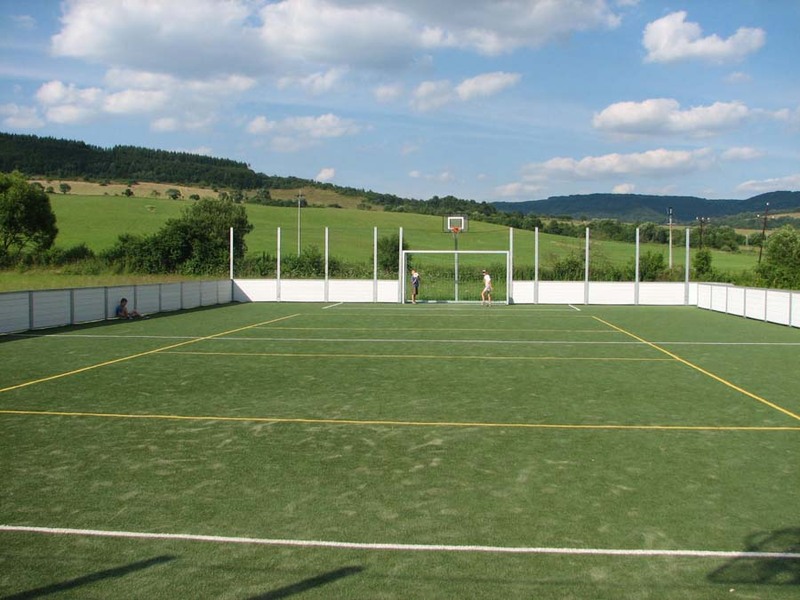 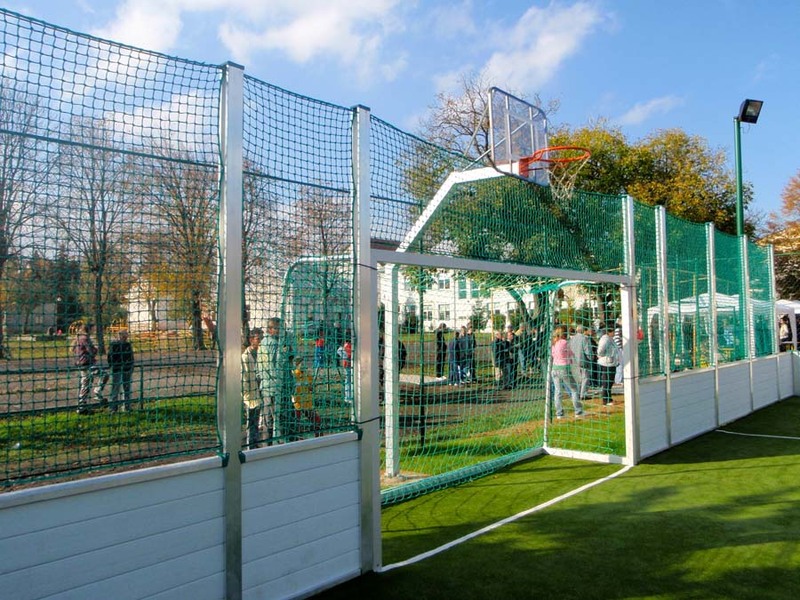 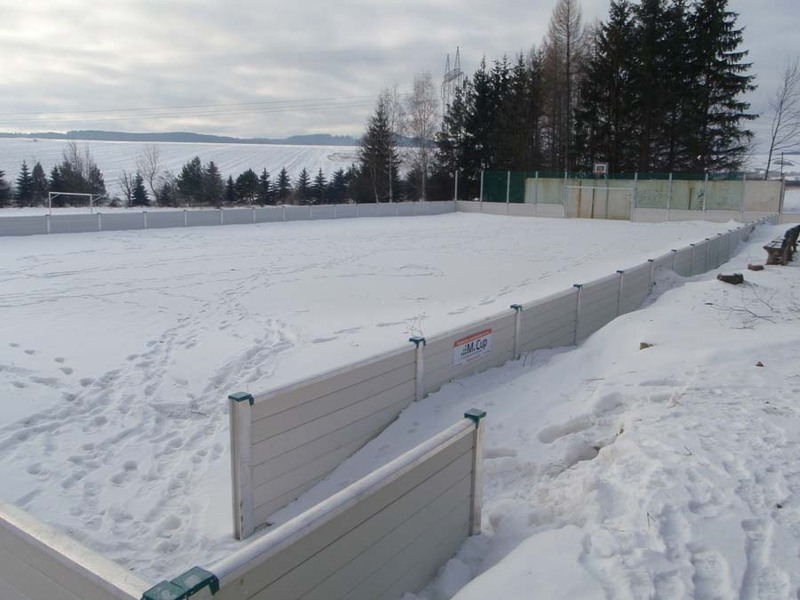 Pitch is equipped by 2 football goals, which are built in 3 meters high back-wall. 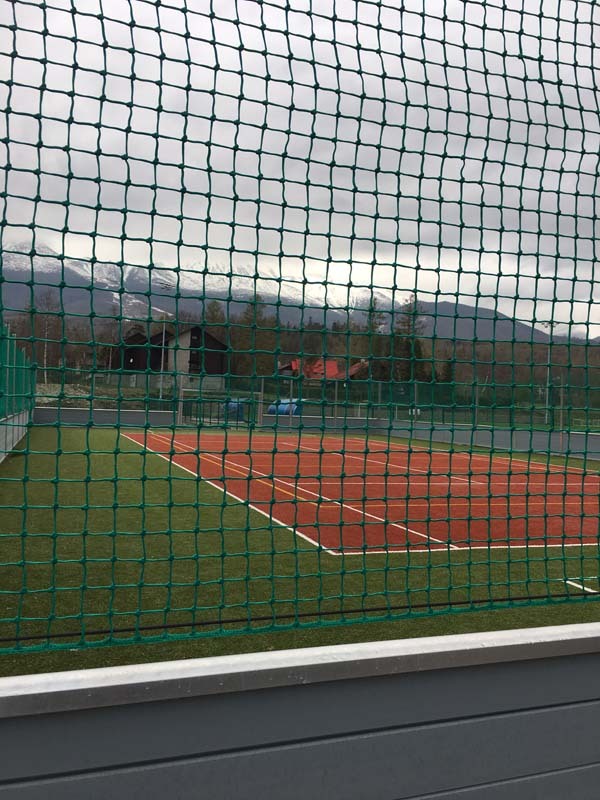 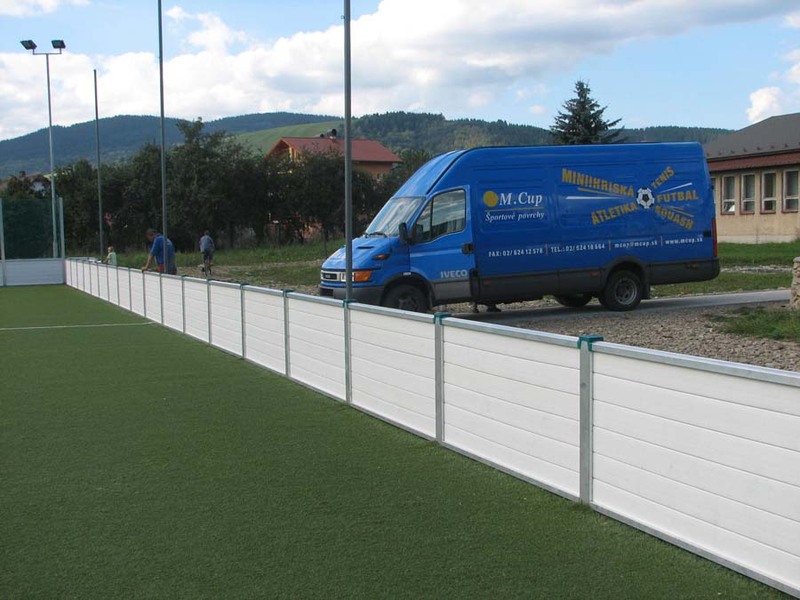 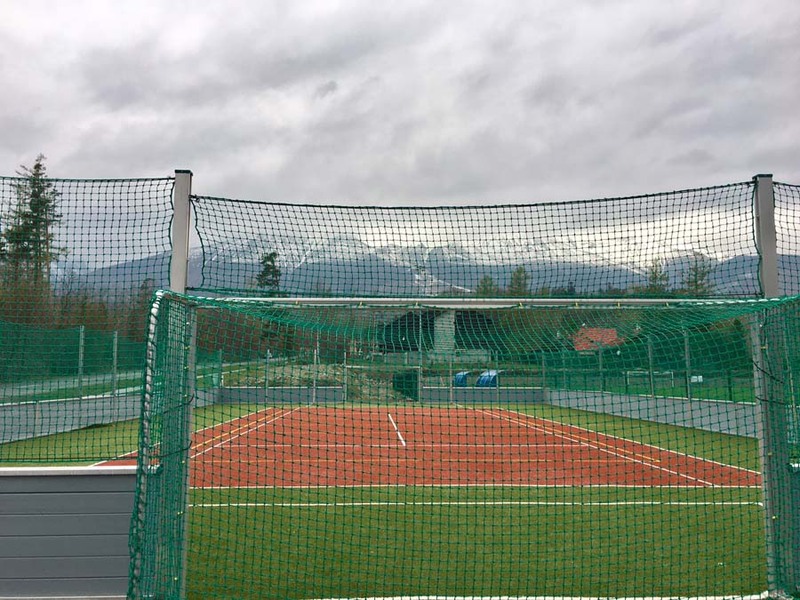 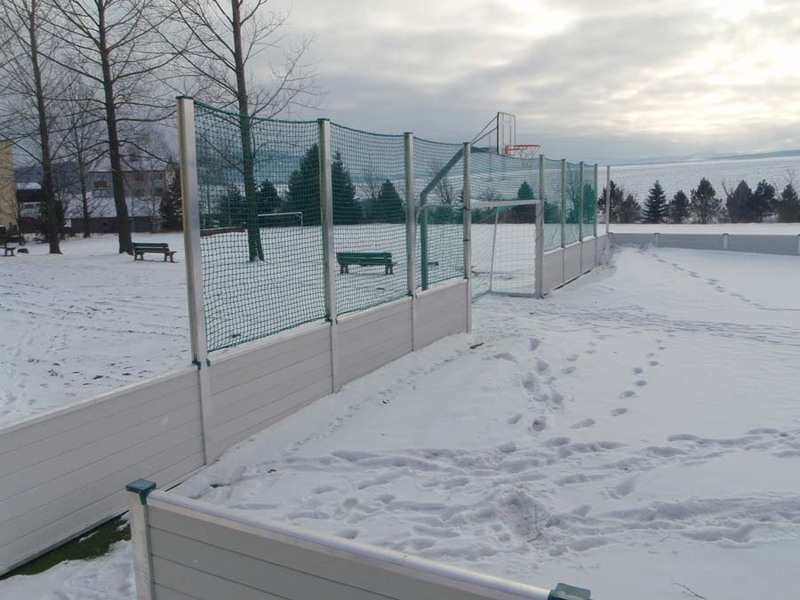 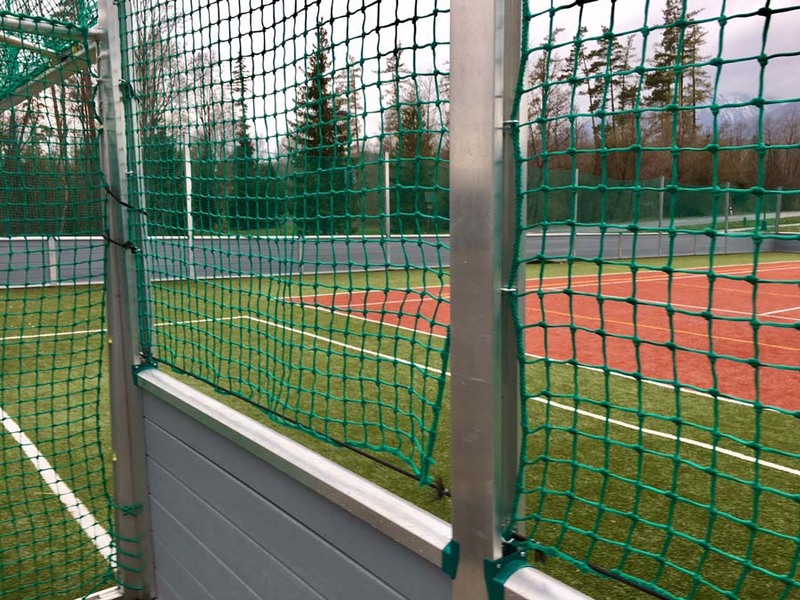 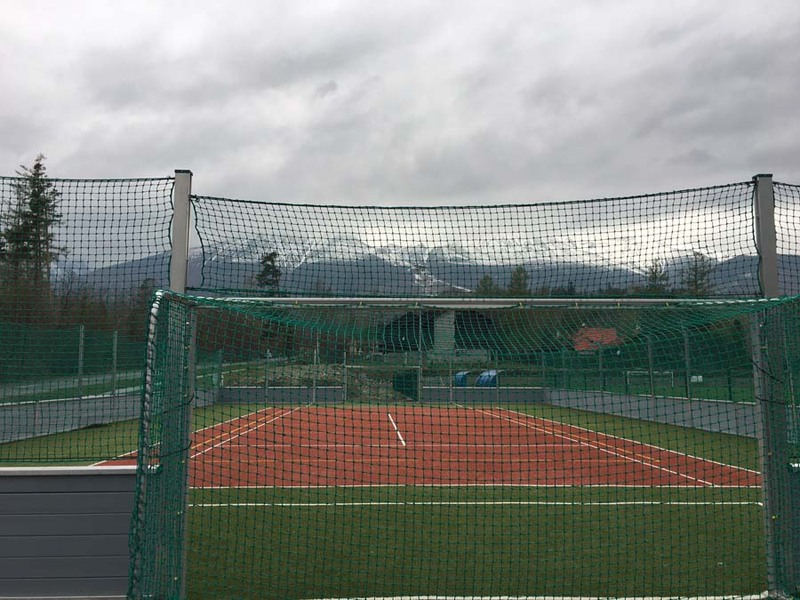 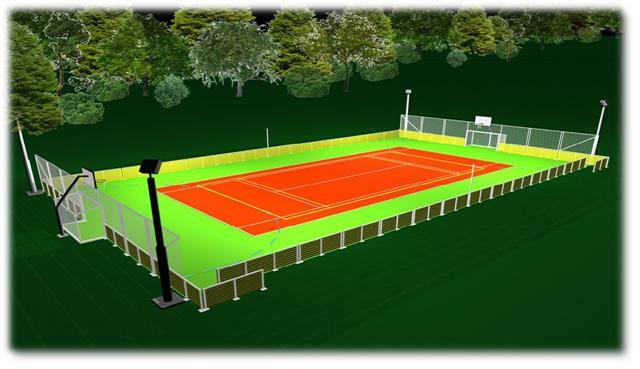 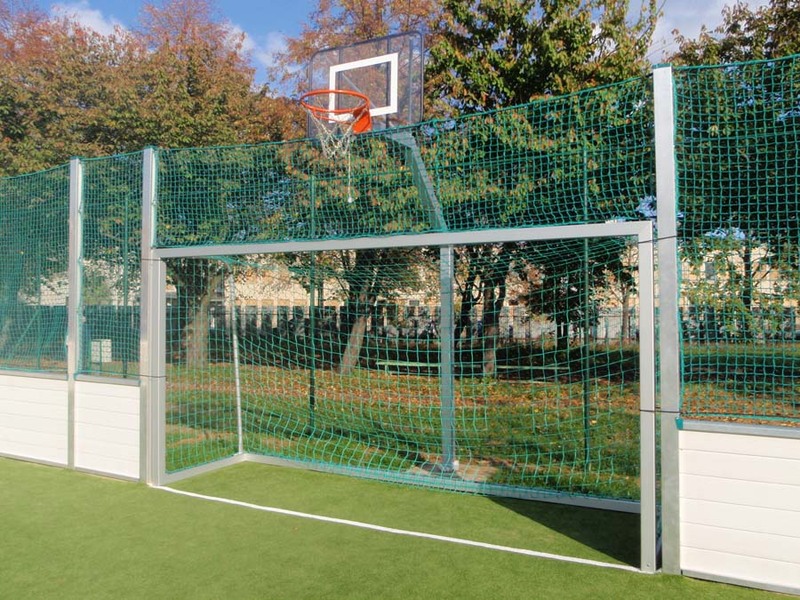 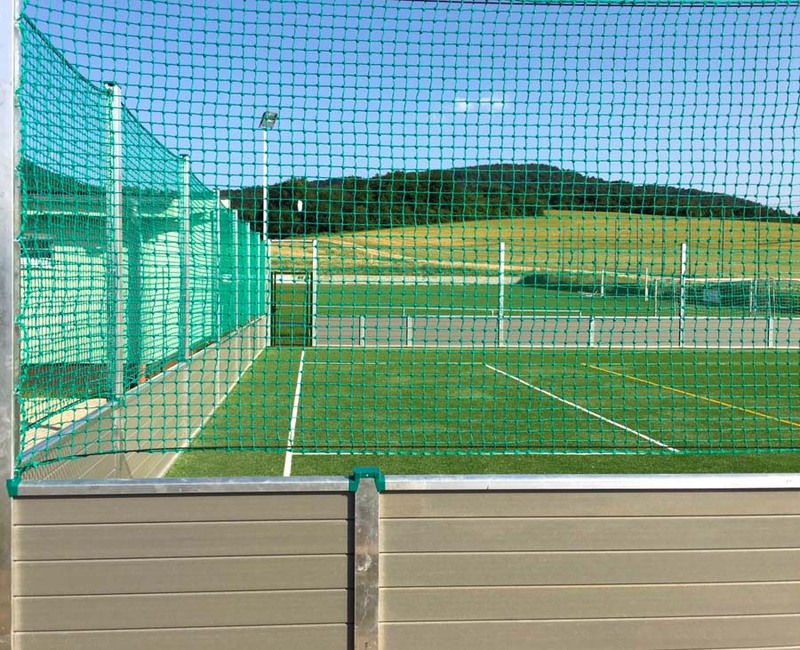 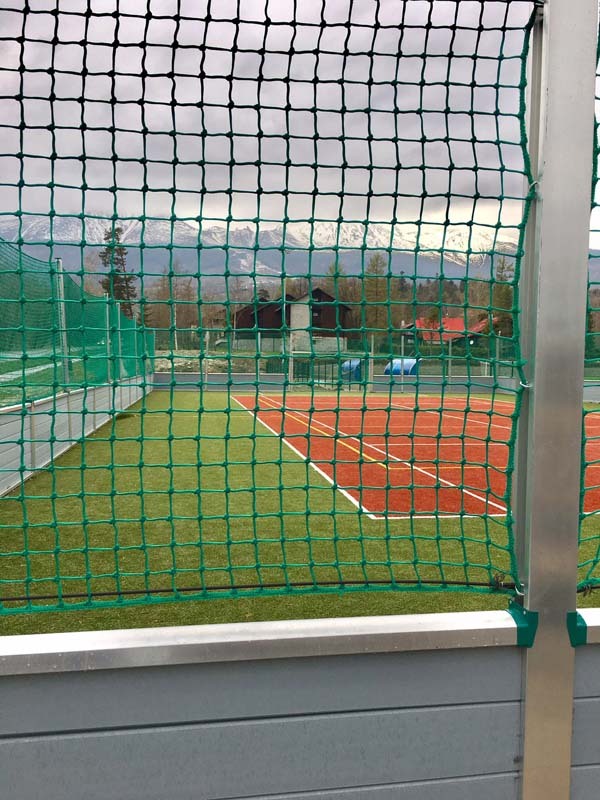 There is 1 meter high barrier system on the sides of the field consisting of beam made of aluminum profiles in which are placed plastic panels and over the barrier system of rear panels are 2 meter high posts with combination of nets. 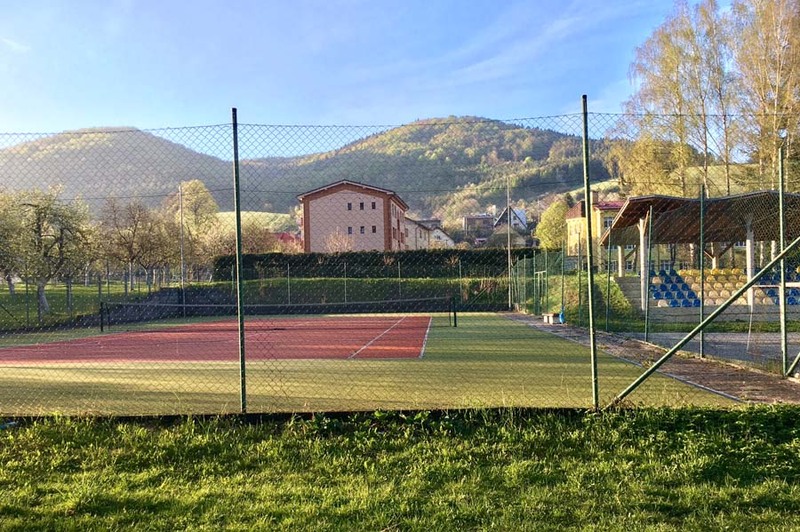 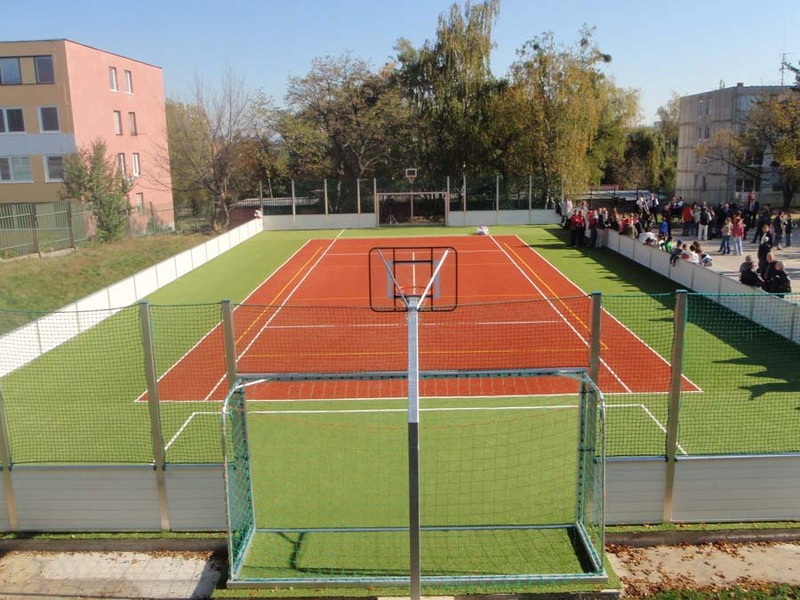 Multifunctional alternatives: lines for tennis, football, basketball, volleyball, or handball. 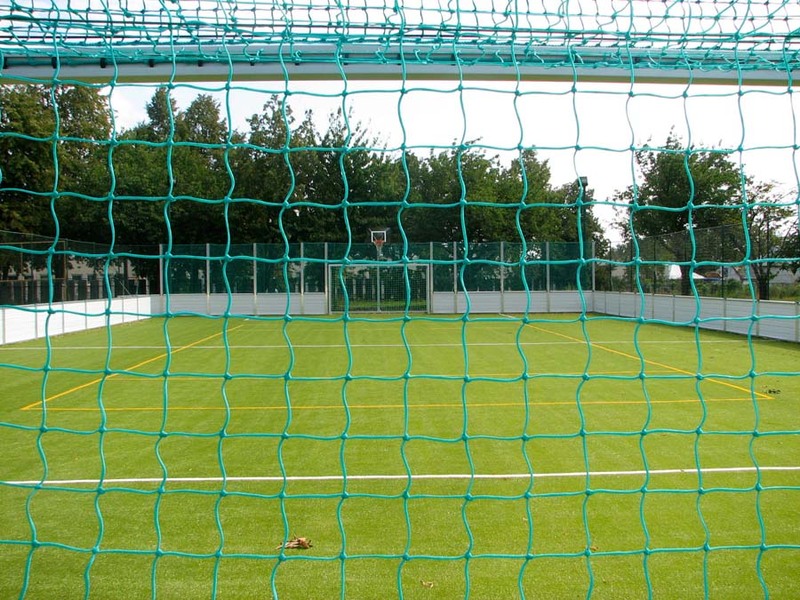 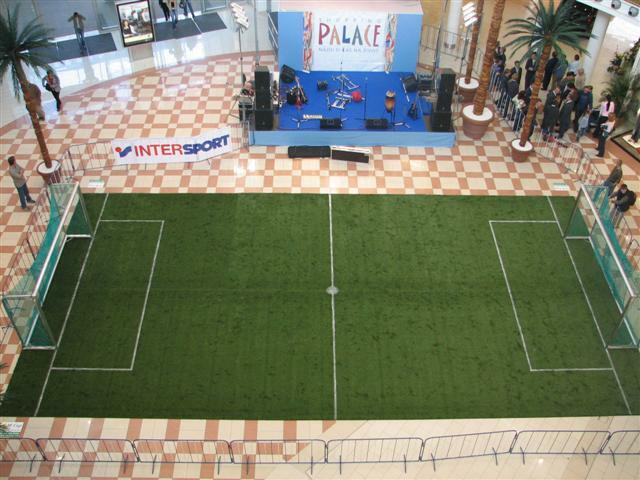 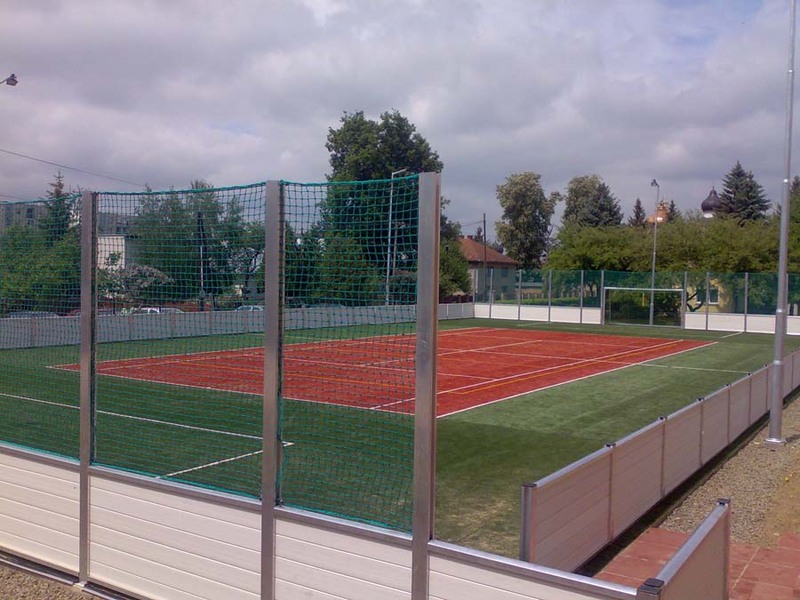 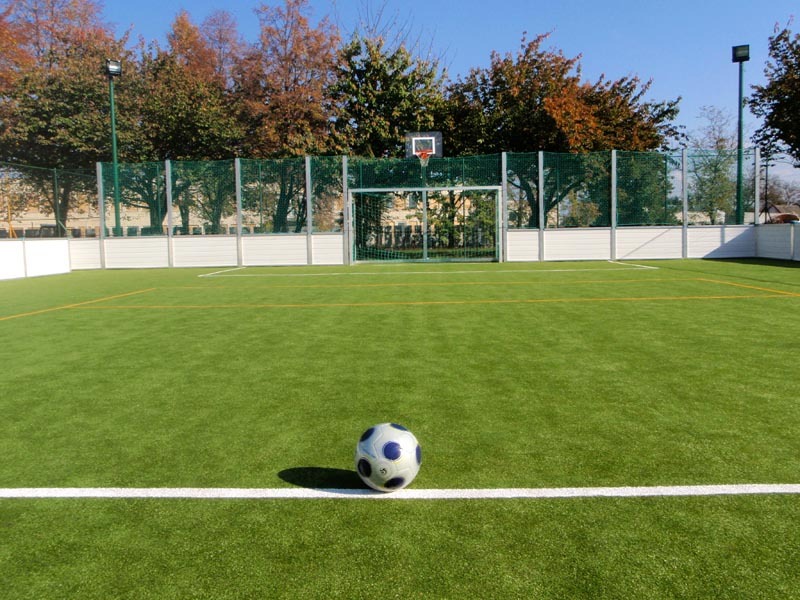 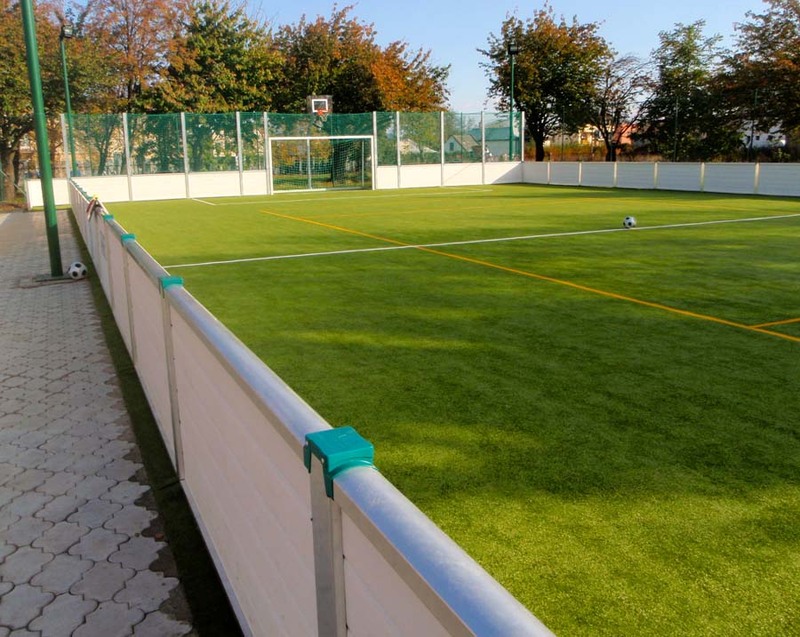 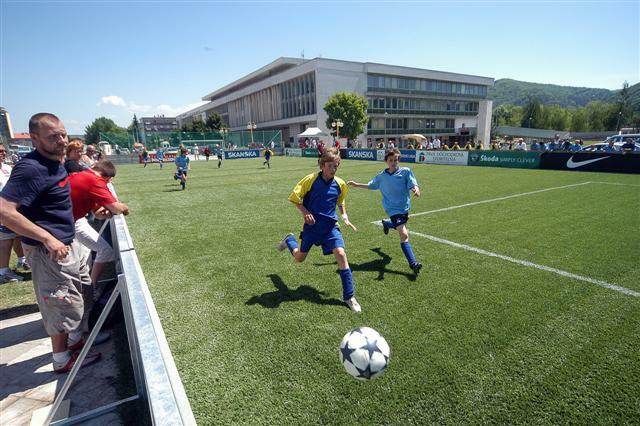 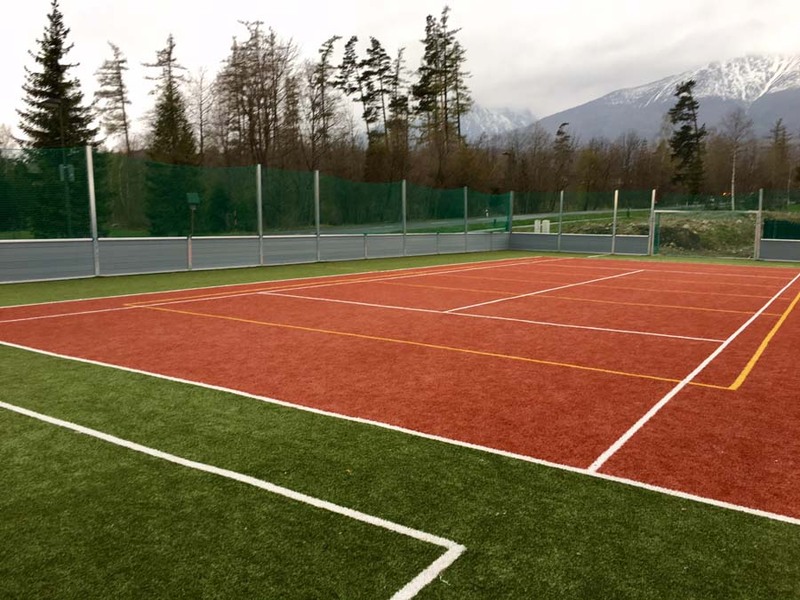 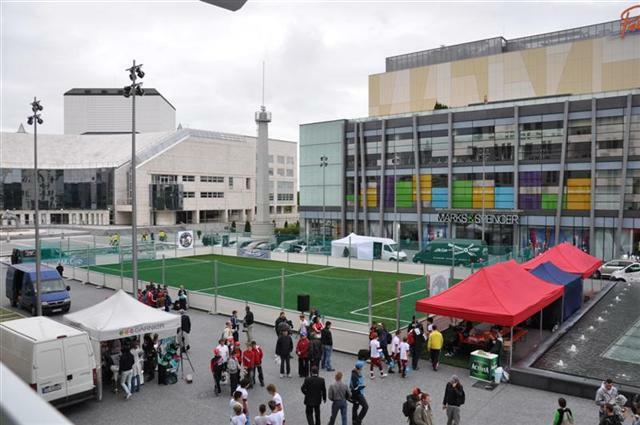 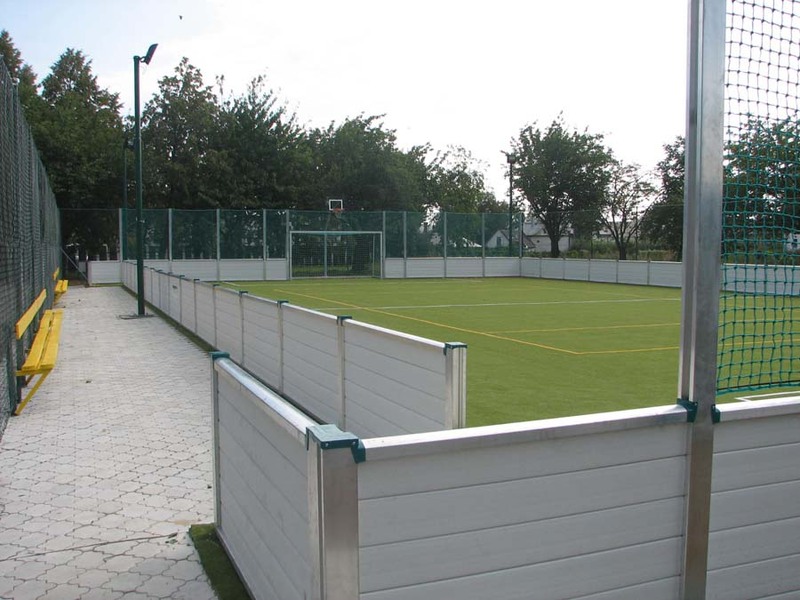 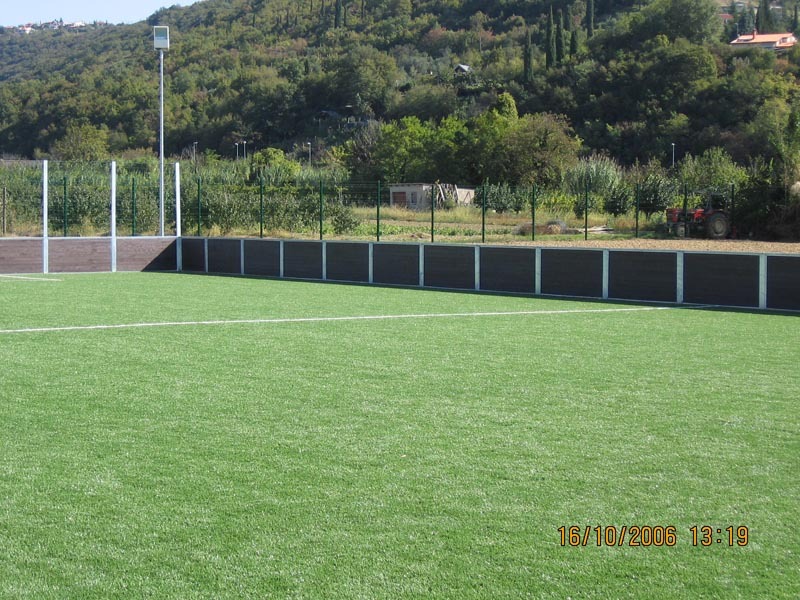 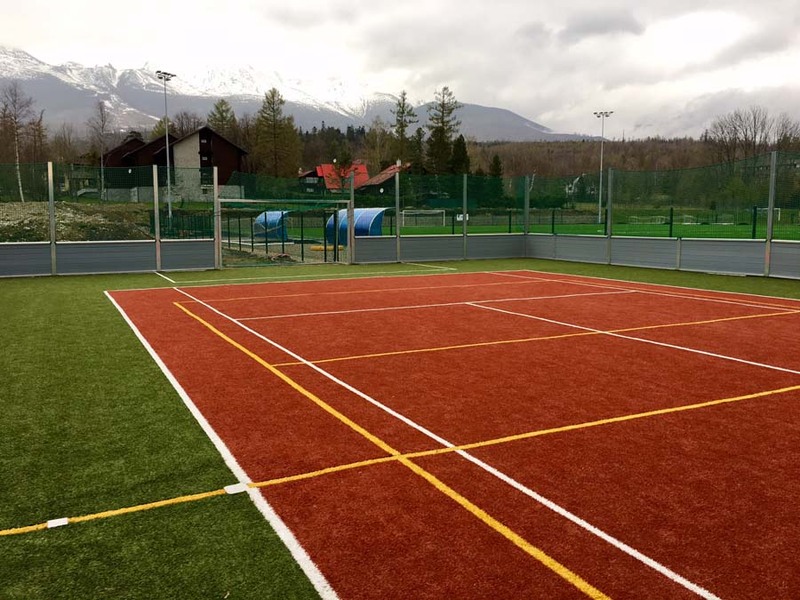 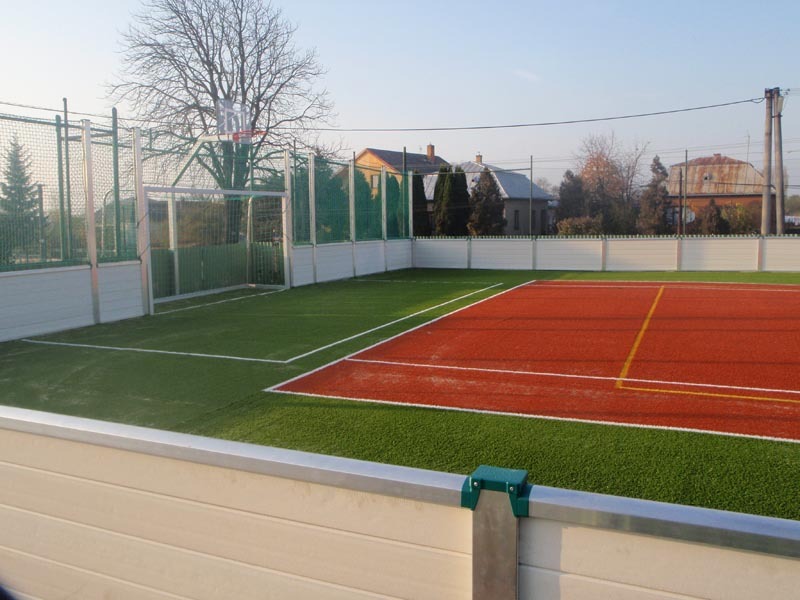 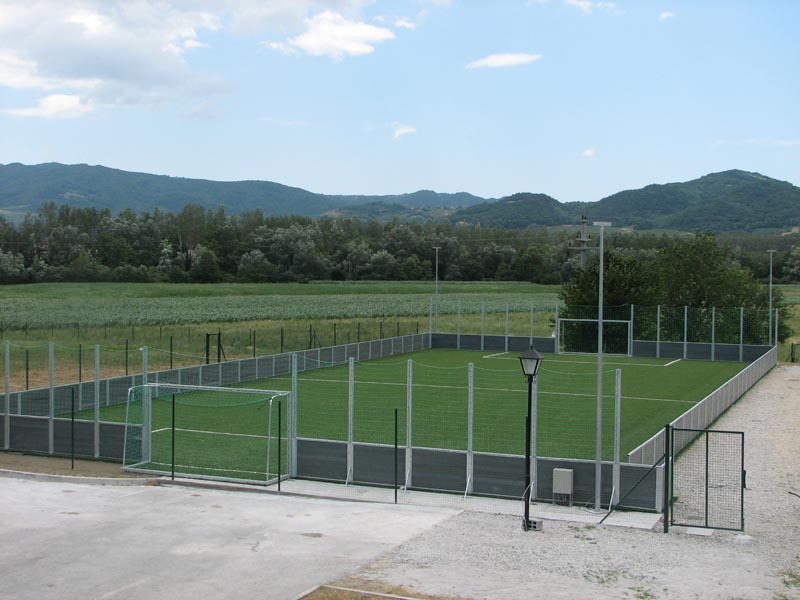 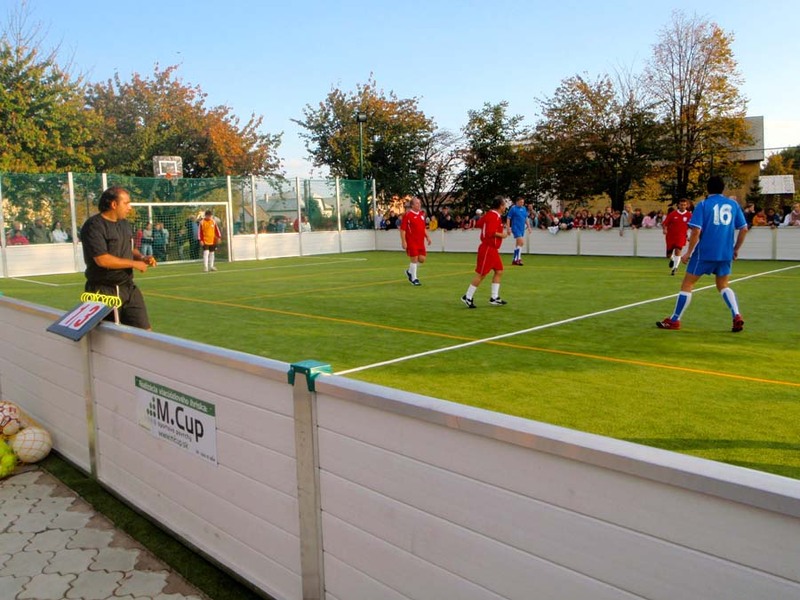 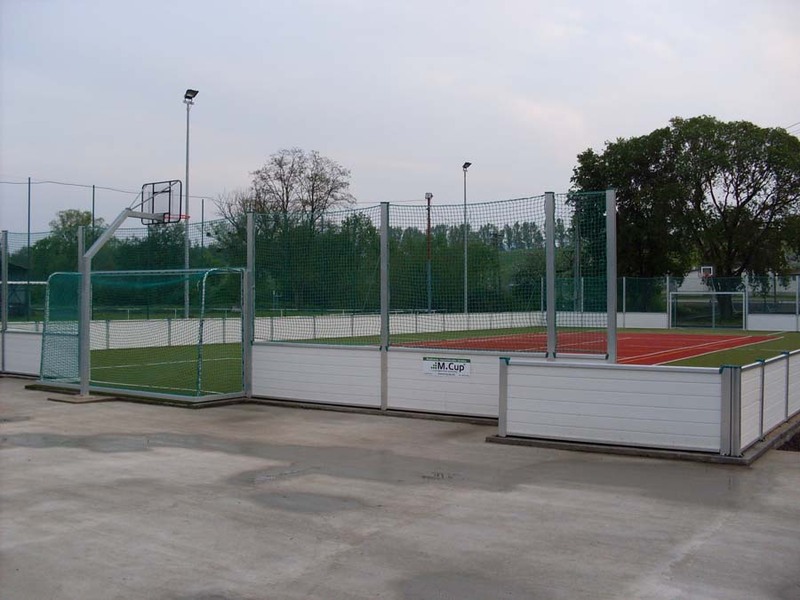 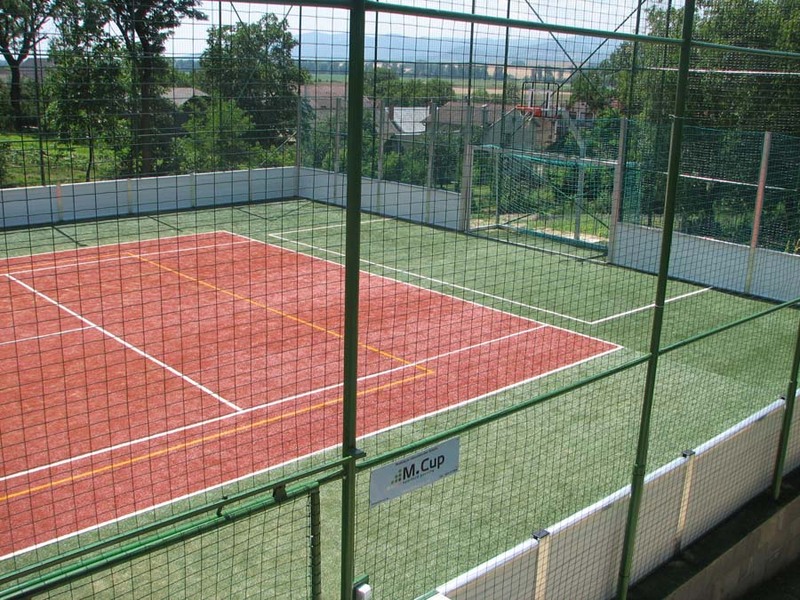 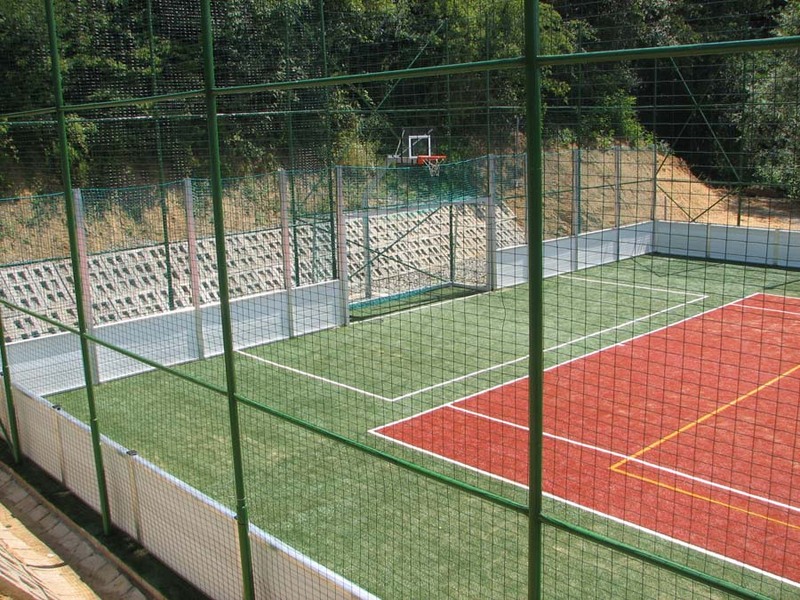 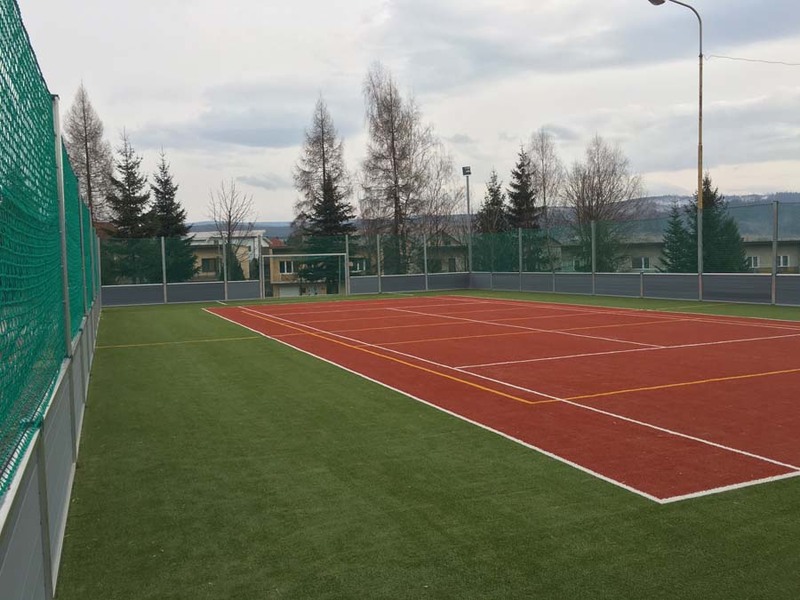 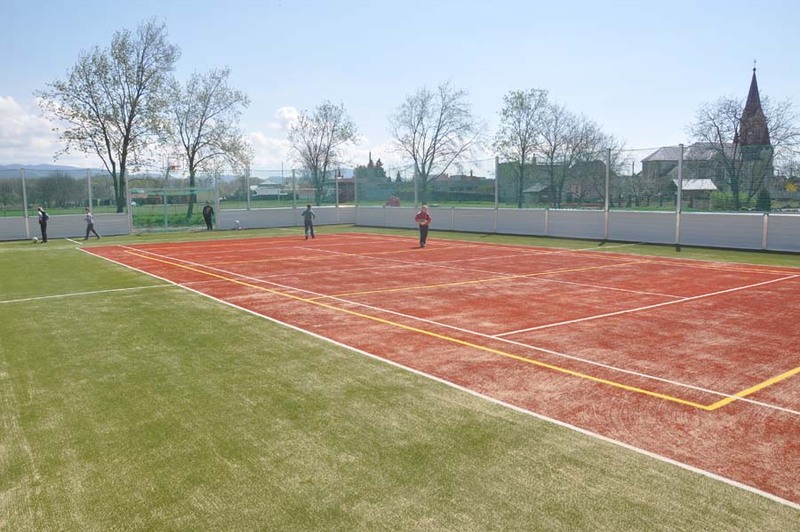 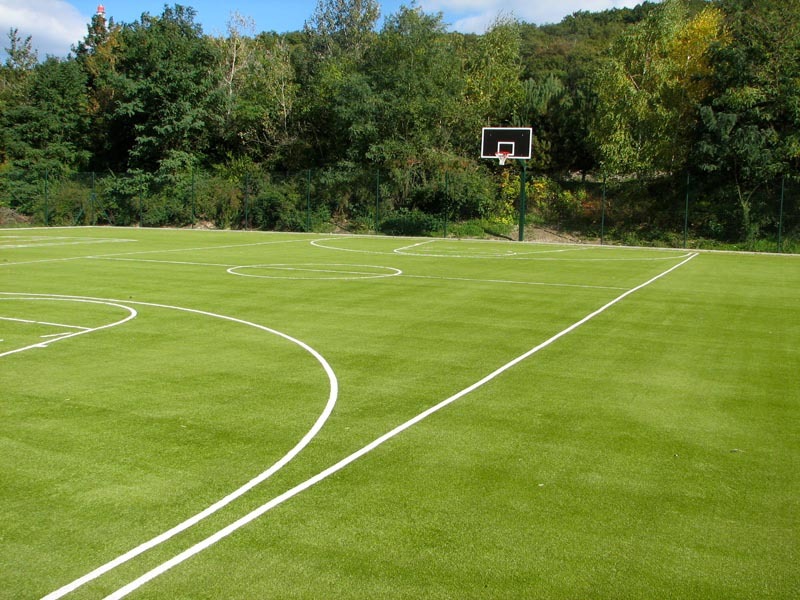 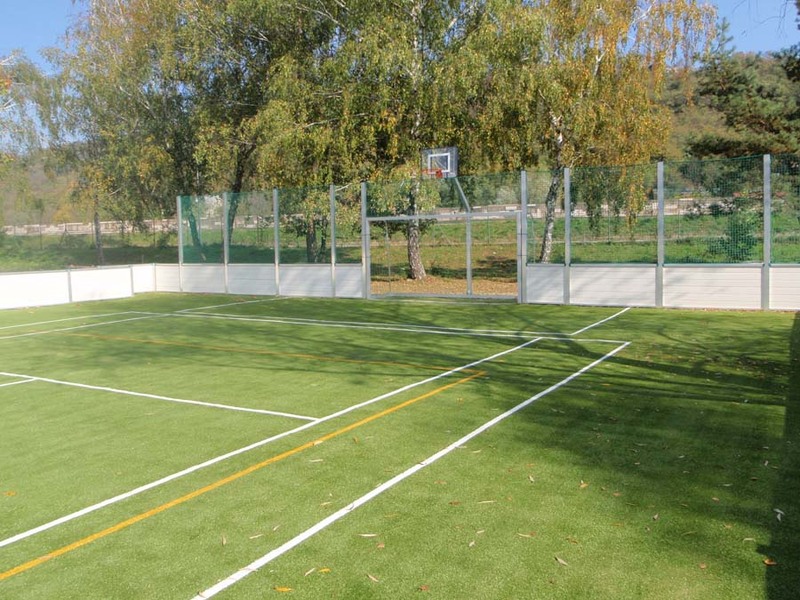 We use usually sport surfaces made of artificial grass with combined use for example tennis, football, volleyball etc. 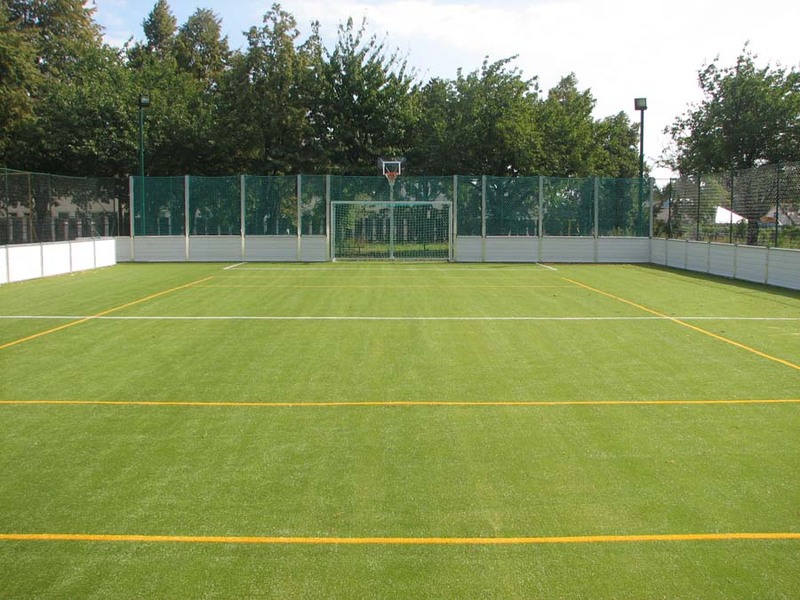 As a filament we use silica sand poured into turf. 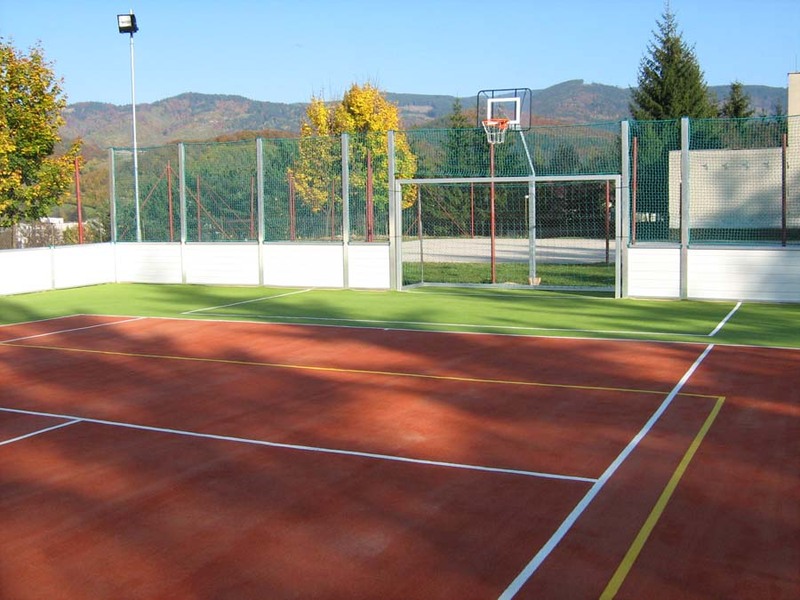 Subbase: Subbase mostly consists of drainage subbase of crushed stone, concrete or asphalt carpet with sloping 0, 5%. 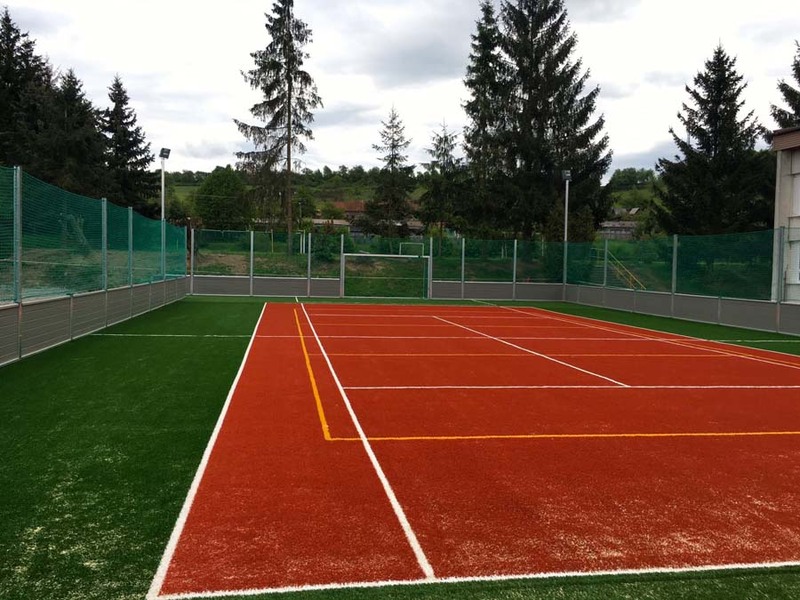 If you wish softer surface, there is a possibility to place a rubber plate between subbase and turf that makes surface bouncy. 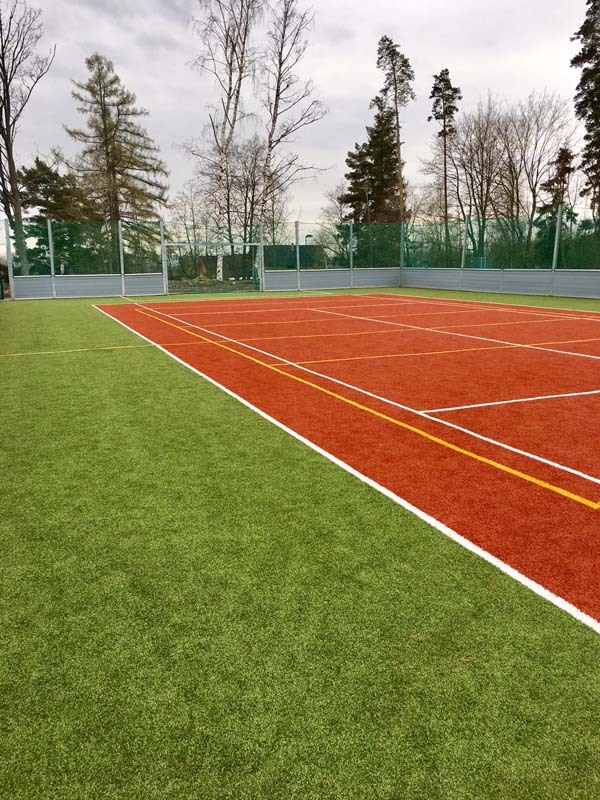 Installation: we put prepared rolls of turf on subbase surface, deploy them and paste them on contacts spots. 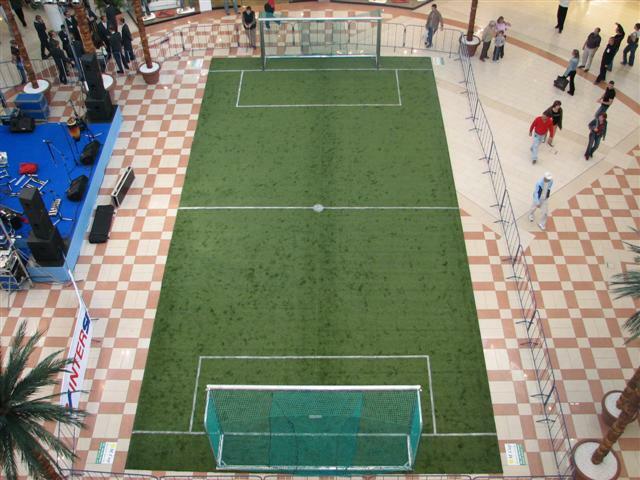 We cut line positions and into them we paste lines for appropriate games. 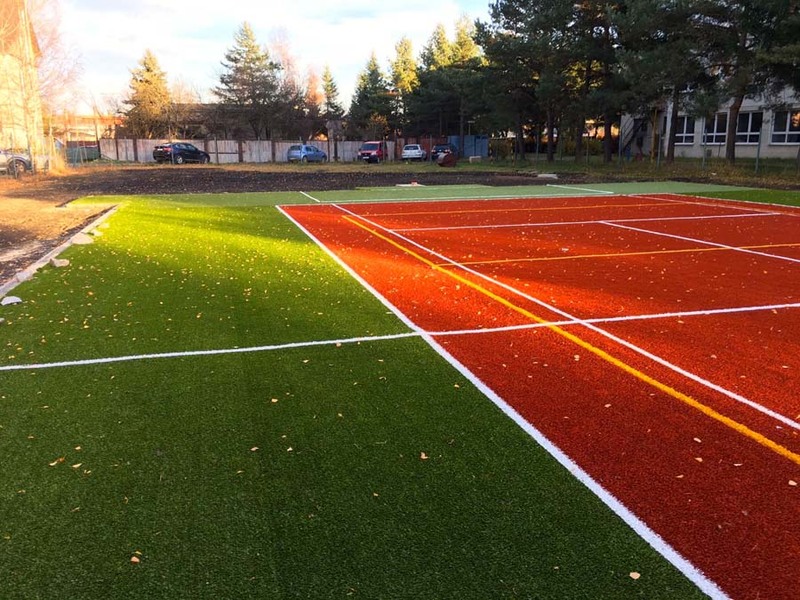 Then we put sand filling equally in turf, which has to be aligned to 70% of lawn height. 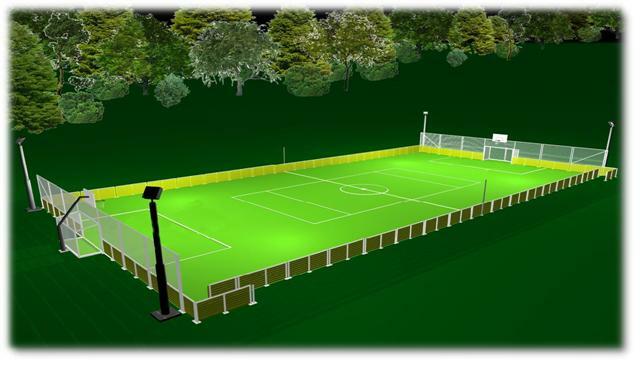 As additional equipment for multi- purpose pitch we offer lighting consisting of poles with 4 lights placed in pitch corners. 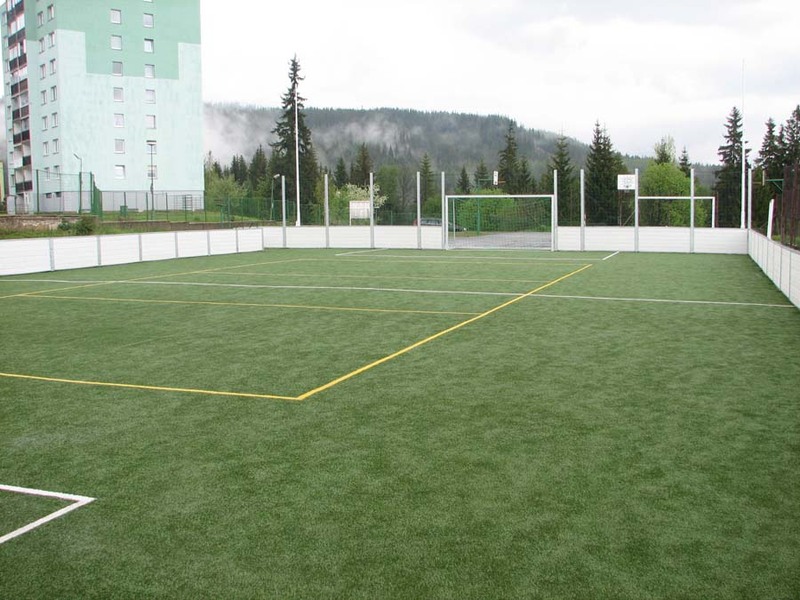 Multi- purpose pitch requires minimal maintenance and maximizes playing time during year. 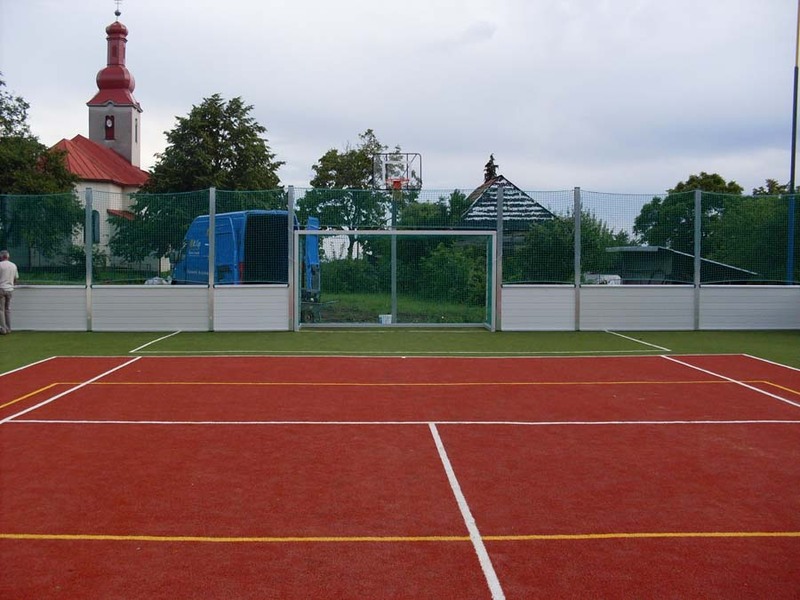 Suitable for: schools, towns, villages, municipality etc. 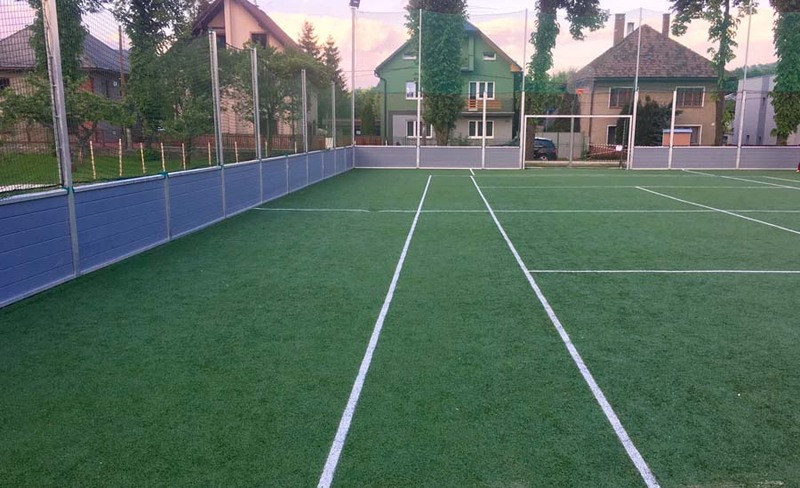 Suitable for irregular actions, sport tournaments, commercial events etc.